Vernon Street was lengthened to access the Cleveland, Akron and Columbus Railway when the Depot was built in 1873. Then in September 1875, Joel Letts laid out the Letts addition to the town which contained 14 acres and 97 Perches of land laid off in 37 Inlots each 10 poles long north and south and 4 poles wide East and West just south of the railroad. 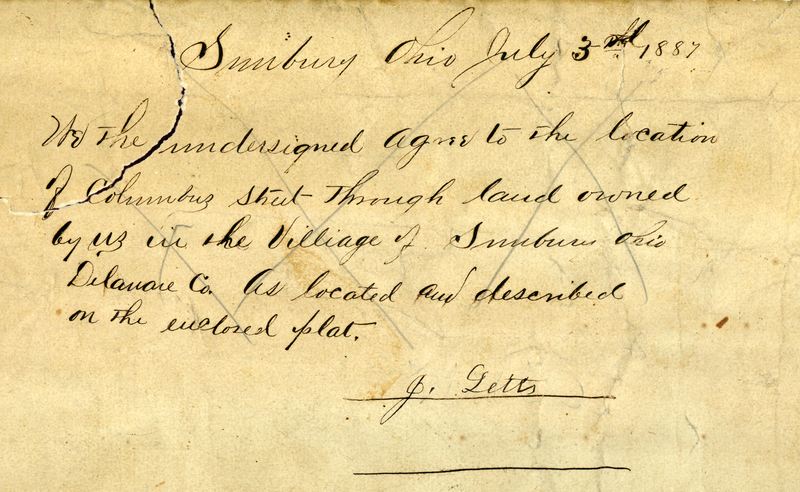 A Survey Map done for the village on May 16-18, 1883, shows un-named Letts as the southern border of the town but not connected to Columbus Street.. This map shows the square stones embedded in the intersections and the railroad with 5 grade crossings: Columbus, Letts, Vernon, Granville and Cherry. 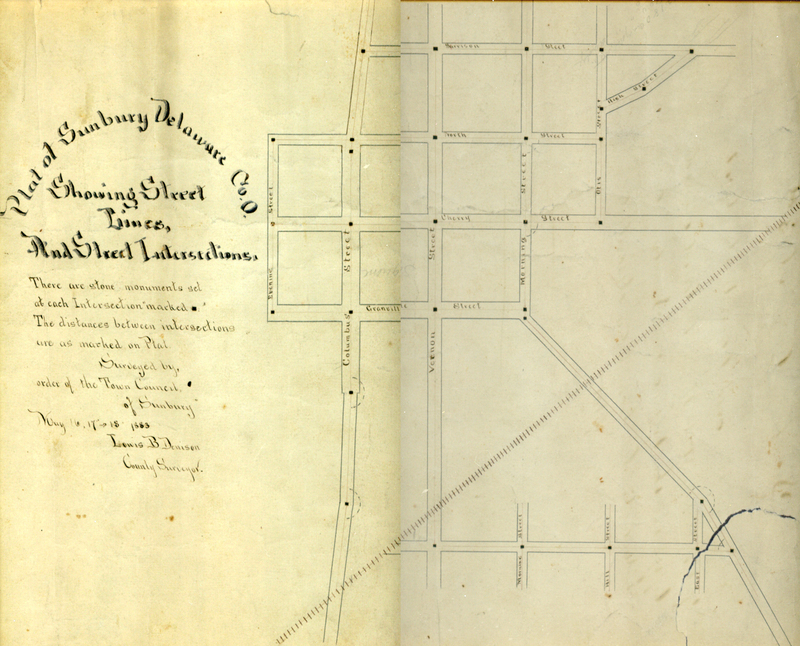 On January 6, 1916, Sunbury Village Council declared its intention to appropriate property for the purpose of opening and extending Vernon Street from its terminus at the railroad south to Letts Avenue. People who could see the Depot would not need to get there by going east to Granville Street then through town and south on Vernon. 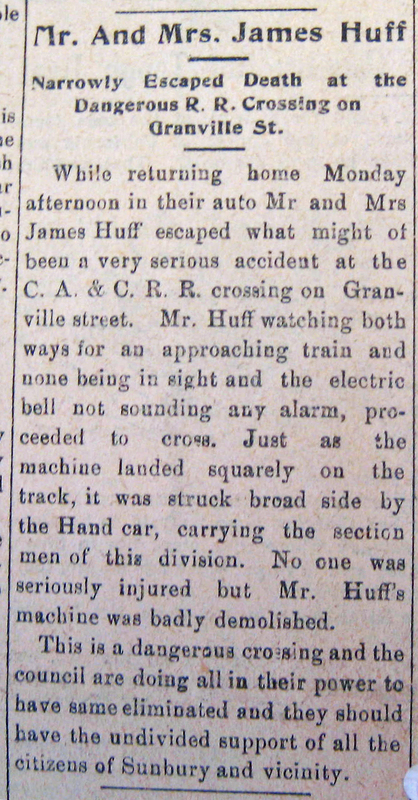 The May 4, 1916 edition of The Sunbury News reported Mr. and Mrs. James Huff narrowly escaped death at the Granville Street crossing. Mr. Huff watched both ways and saw nothing on the tracks and the warning bell was not sounding so he proceeded over the crossing but was hit broadside by the Hand Car carrying the section men of the division. No one was hurt but the Huff car was demolished. Citizens were urged to encourage town officials to do something about this intersection. Three months went by after Sunbury Village passed an ordinance for elimination of the grade crossing on Granville Street but the railroad company failed to cooperate with the village in the preparation of plans to move forward. The Village brought suit against the railroad which was set for hearing in the Common Pleas Court before Judge Jewell on Monday, July 24, 1916. In the July 20th newspaper, it said, “On Monday morning officials from the C.A.& C. Rwy visited Sunbury to discuss the extension of Vernon Street across the company tracks and the proposed subway bridge at the Granville crossing. While the railway officials were favorable to eliminating the grade crossing at Granville they were opposed to the Vernon Street extension because it would provide another grade crossing. The RR officials proposed to extend Letts west to the Sunbury and Galena Road and offered to bear a portion of the expense incurred obtaining the right of way, grading, ballasting and macadamizing such road.” Sunbury was to hold a special meeting to discuss the issues. Vernon Street was extended over the railroad to Letts as shown on the 1883 plat map. Letts ended at Vernon Street, eliminating one grade crossing. Meanwhile Federal and State laws passed to protect the people and the trains. One law required trains to stop at the edge of a town and someone carrying a lantern walked the train though the town. 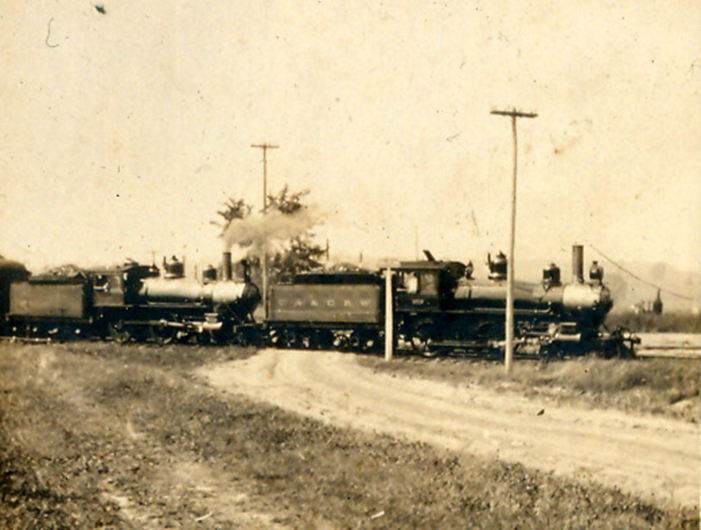 Trains were also required to blow their whistle at each intersection to alert drivers to clear the crossroads. Sunbury had four. The railroad objected. The late Essa Willison lived with her parents at 37 Letts where the road curved to go over the tracks. She told of being awakened during the night in the late 1920s by the railroad pounding posts into Vernon Street where it crossed the railroad and connected to Letts.. Once again the people on Letts had to go east to Granville Street then into town over the grade crossing on that road. To make the slope from Letts to South Columbus Street, the Willisons agreed to dedicate a strip of land 50 feet wide along the south railway right-of-way provided the village build a fence to turn stock before construction began. They also asked Letts be an avenue of not less than 16 feet wide, properly graded, drained, surfaced and lighted. In addition there should be 3 foot berms. Thus the s curve was put in Letts Avenue so vehicles could make the turn from Letts to Columbus Street and go under the subway. To make matters worse, while dynamiting the hill out for Columbus Street, a large air-borne boulder hit the house at 466 S. Old 3C Road, destroying much of the front of the house. The village had to build the subway, extend Letts Avenue to connect to Columbus Street and fix the damaged house. The village had its first avenue. 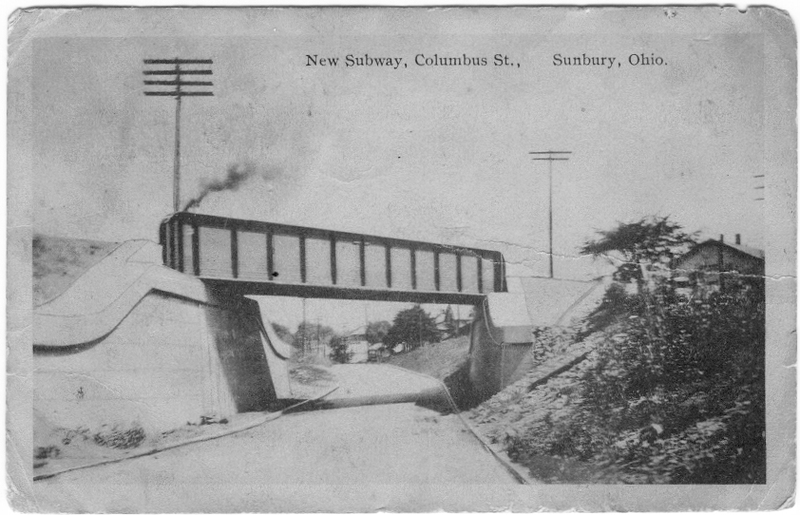 Only remaining subway in Sunbury is now part of Preservation Parks and is part of the bike path.